These Atypical Pit Craters (APCs) generally have sharp and distinct rims, vertical or overhanging walls that extend down to their floors, surface diameters of ~50–350 m, and high depth to diameter (d/D) ratios that are usually greater than 0.3 (which is an upper range value for impacts and bowl-shaped pit craters) and can exceed values of 1.8. 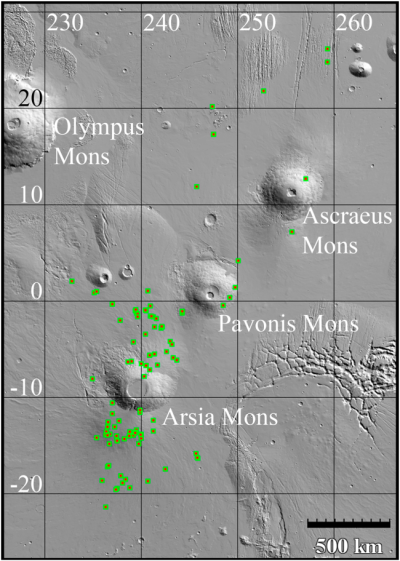 Observations by the Mars Odyssey Thermal Emission Imaging System (THEMIS) show that APC floor temperatures are warmer at night and fluctuate with much lower diurnal amplitudes than nearby surfaces or adjacent bowl-shaped pit craters. In other words, these pits are deeper with steeper and overhanging walls that suggest underlying passages. They also maintain warmer temperatures at night with their day/night temperatures changing far less than the surface, similar to caves on Earth where the cave temperature remains the same year-round. The study’s most important finding, from my perspective, was the location of these pit craters. More than 100 were located along the line of the three giant volcanoes to the east of Olympus Mons, the solar system’s largest volcano, as shown on the map to the right. The majority were clustered around Arsia Mons, the southernmost of the three volcanoes, and a place where scientists believe there were active glaciers in the past, a belief that is strengthened by the routine occurrence of water vapor clouds above Arsia Mons’ slopes, suggesting a lot of still present underground water. Put the two together, available water plus underground caves, and you have an ideal place to establish the first human colonies on Mars. The water provides oxygen and energy, while the cave provides a convenient and easy place to build those first habitats. Not only does the natural roof provide radiation shielding without the need for major construction, you can seal it more easily to create an artificial atmosphere. And because the temperature ranges are more reasonable the environment will be more benign for both equipment and humans. The geology that forms these caves is in itself fascinating, as Mars’ lighter one-third gravity field changes how things happen. 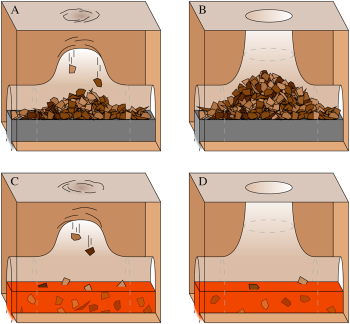 As shown on the left, the paper proposes two main theories for the formation of these pit craters, which are believed to be part of the lava tube flows coming down the volcanoe’s slopes. In both cases a lava tube forms. In the top example the flow ceases before the roof collapses, so that the roof debris accumulates on the bottom of the pit and can often block access to the additional cave passages on either side. With the bottom example, the roof collapse occurs while the lava is still flowing, which transports the material away and thus prevents it from blocking the entrances to the side passages. There are only a handful of Earth equivalents to these deep lava tube formed pits. On Earth the high walls and significant overhangs do not last long in the stronger gravity. With Mars’ lighter gravity, however, it is possible for much more delicate underground structures to survive. Thus, it is very possible that the lava tubes on Mars are larger in volume at any one point. The lighter gravity however is going change how the lava flows, so estimating their length is at this point more difficult. The bottom line: Locating these pits also helps locate Mars’ prime real estate for human colonization. They not only provide quick and easy havens for construction, their location in the same area where glaciers and underground ice is expected to exist makes surviving there far easier. Great news on the finding of more caves on Mars! With all the likely water, reduced radiation impact, better temperatures, these will be great spots to look for extant Martian life. Lets hope we can get a fleet of nicely de-contaminated robotic explorers to investigate these spots prior to the cave in-habitation by Earthlings. This is fascinating, Bob. I agree with your perspective on the study’s most important finding (fwiw). I wonder, what is the trade between latitude and altitude, when it comes to human habitation? Perhaps water and shelter win the day, regardless. Thanks also for linking to that Brown paper and the cloud photos — I had no idea. Do a search on Behind the Black for caves and you’ll come up with a lot of neat stuff I’ve posted over the years, some of which is actually original research poking through data from the moon.